Karen Burns-Booth serves up a hearty start to Christmas Day. Packed with bacon, sausages, tomatoes and spinach – and bound together with paprika-spiced eggs and milk – this dish is sure to please all the family. 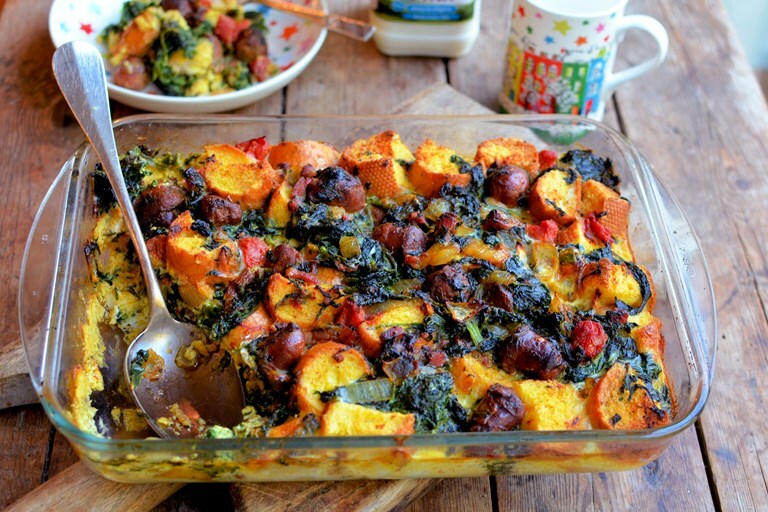 A wonderful breakfast bake that is the perfect way to start the day on Christmas morning – crisp bacon, herby sausages, sun-dried tomatoes and baby spinach give this breakfast bake a festive look and taste which is all baked in a lightly spiced egg and milk mixture. This can be prepared the night before ready for popping into the oven on Christmas morning, thus giving you an easy, tasty and hassle-free celebration breakfast, or brunch, depending on what time you get up!